Even though I live in Israel now, I still celebrate Thanksgiving. I don’t feel like it’s just an American holiday to be celebrated in America, but rather a day to step back from our hectic lives and think about what we’re thankful for. It’s important to take time to reflect on all that we have, all that we were given, what we worked hard for and what we have accomplished. There is so much in our lives that we take for granted as life, especially since our lives are so fast-paced and never seem to slow down. So to step aside one day and really appreciate all that we have is critical. Honestly, I would love to have a Thanksgiving at least once a month! And it’s not like the cooking is really that different from a regular Shabbat which happens every week, so really why not?! But anyway, back to giving thanks — I feel like I’ve been blessed with a lot this past year. I found something to study that I am passionate about and isn’t going to just be a job for the sake of a job. I made my place in Israel and in my community. I have a loving and ever-so-patient husband, and I have all of you readers! Your love and support means the world. Each like and comment on Instagram, each DM and anytime someone meets me and puts together that I am Joodie the Foodie and gets really excited, it fills my heart. It empowers me to keep doing what I love and sharing my adventures in the kitchen with you. Some days it’s hard and stressful — this isn’t my full-time job nor do I plan for it to be; I am actually studying to be a UX Designer and plan to work in that field. But I keep doing the Joodie the Foodie thing because I love it and am passionate about cooking, styling, photography and, now, even writing. I love seeing people recreate my food in their kitchens and I love bringing family and friends together around a nice big meal. Also, I am obsessed with tablescapes and party planning so to be able to do it just for fun is amazing. This year we’re actually lucky enough to go to two meals: one with family and one with friends, so that means double the thanks! It also means I’m not doing any real cooking which is crazy because holidays are usually my jam — though I am planning a Chanukah party, so saving my energy for that is fine by me. Definitely stay tuned to see what I have in the works for Chanukah, it is going to be epic! Anyway, since we’re out this year for Thanksgiving, I’m only cooking a couple dishes, and I decided on cornbread and cranberry sauce — two staples of a Thanksgiving meal. I planned to make a persimmon chili for dinner the night before and thought what could go better with chili than cornbread. Perfect time to test out a moist pareve cornbread recipe! When I was thinking about how I would want to plate that — yes, I usually visualize that before I even start cooking — I thought that waffle-shaped cornbread would be an even better idea. 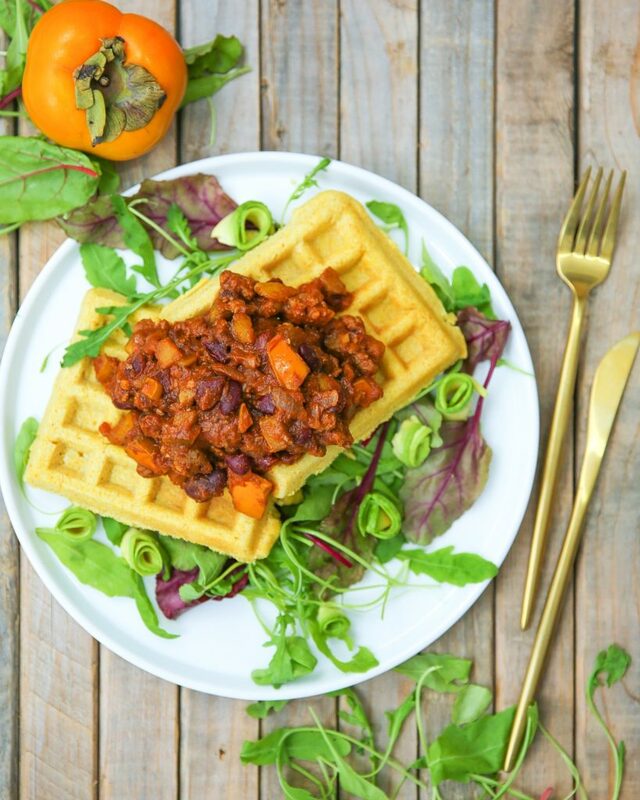 Cook time is much less, it’ll plate much nicer and who doesn’t love eating waffle shaped food?! The combination of the moist cornbread with the persimmon chili was a perfect match. If you’re not up for a big Thanksgiving meal this year or you just want to keep it simple but still want to get into the festivities, this dinner is definitely a great choice. Cornbread is a Thanksgiving classic and what says Fall more then persimmons! If you want to take it up a notch, substitute the ground beef for ground turkey and it’s like a whole Thanksgiving dinner in one dish! Serve it over some greens since it’s always important to add color and something fresh to your meals! Happy Thanksgiving everyone! May we always appreciate and be able to give gratitude to the good things in our lives. Gobble, Gobble. Heat up a large pan over a medium flame and add in the meat. Brown the meat and remove to a plate. Add the onion into the pan and sauté until golden. Add in the garlic and sauté for 1 minute, just until fragrant. Add in the persimmon and mix in and stir for a few minutes just until they begin to soften. The more ripe your persimmons are the less time you need to sauté them. Add in both cans of sauces, kidney beans, sugar, salt, cumin, garlic powder and chili powder and mix to combine. Start with a little less sugar and chili powder and adjust according to your preferences. Also some persimmons are sweeter then others so you might not need any sugar at all! Bring the mixture to a simmer and lower the flame. Cook for 20-25 minutes. 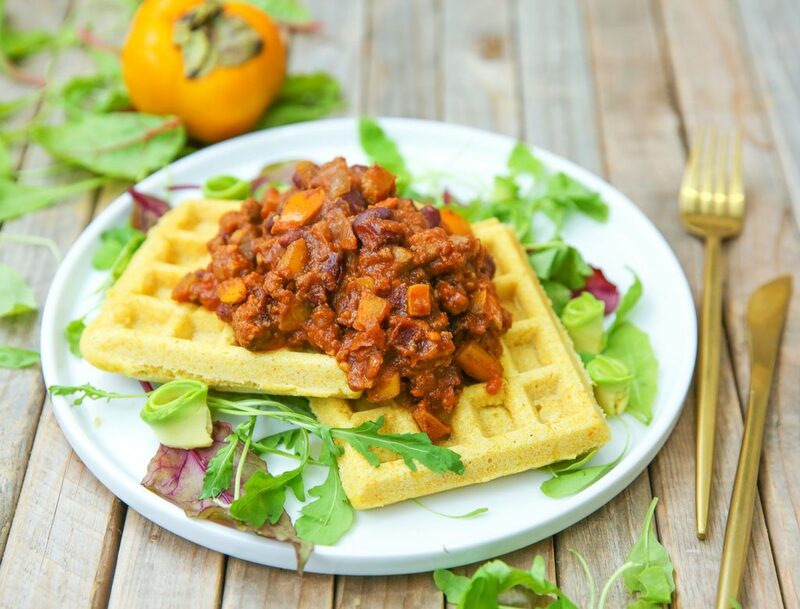 Serve hot over cornbread waffles. Mix all the dry ingredients together. Mix together the wet ingredients and fold into the dry ingredients. Mix until everything is incorporated. Heat your waffle iron and spray with cooking spray. Add the batter (I used 1/4 cup batter for my square waffle iron) and cook until both sides are golden, about 5 minutes. Timing will vary based on the strength of your machine. Alternatively, pour into a greased 9x13 pan and bake at 350 F for 18-20 minutes, until a toothpick inserted in the center comes out clean.